Product #5671 | SKU JAB72301 | 0.0 (no ratings yet) Thanks for your rating! 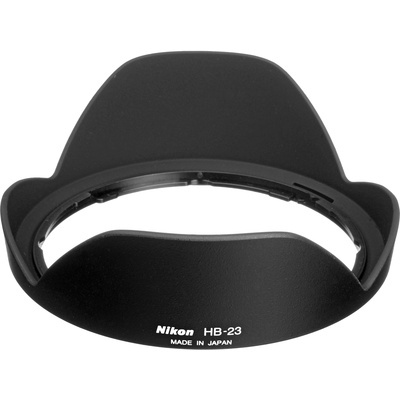 The HB-23 Bayonet Lens Hood from Nikon is a petal-type bayonet mount lens hood for select Nikon wide-angle zoom lenses. The "petal" shape of this lens hood maximises the amount of hood coverage for the minimum amount of weight and hood area. This dedicated lens hood is designed to match the specific focal length of select NIKKOR lenses. Box Dimensions (LxWxH) 4.8 x 4.7 x 2.4"